John Lasseter is a Disney success story very much like the movies that he oversees. 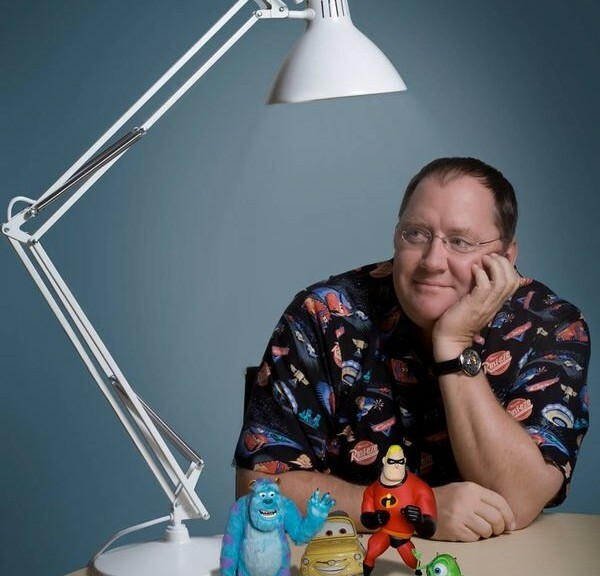 If you don’t know who John Lasseter is, he’s been the one behind every major Disney animated movie since 2006. Before that, he was the creative force behind Pixar. He is now the Chief Creative Officer of Walt Disney Animation Studios. He was also fired from Disney. A visionary, he began his career at Disney working behind the wheel of a Jungle Cruiser at Disneyland when he was a student at CalArts in the 70’s. He was the second student enrolled at the CalArts character animation program, created and taught by longtime Disney animators. While at school, he produced 2 animated shorts, both of which won him the student Academy Award for Animation. Those shorts caught the eye of Disney animation. When he graduated in 1979, he got a job at Disney as an animator beating out over 10,000 applicants. After they completed the work on 101 Dalmations, Lasseter thought there might be more ways to add new dimension to animation, a longtime dream of Walt Disney himself. He was turned on to computer generated imagery (CGI), seeing some of the first sequences of the lightcycle in the original Tron. He knew that CGI would be that new dimension he was searching for. Unfortunately, those in charge of Walt Disney Feature Animation didn’t like that idea too much. So, after Lasseter completed a test project of Where The Wild Things Are, he was fired from Disney. Lasseter, unfettered, connected with the folks over at Lucasfilm. They had a little division called Lucasfilm Computer Graphics Group. They worked on a revolutionary short film called The Adventures of Andre and Wally B. that would change animation forever as Lasseter, who only wanted to use CGI for the backgrounds, ended up using CGI for the characters as well. In 1984, George Lucas was forced to sell his fledgling division, now named Pixar Computer Graphics, to fund a financially crippling divorce (don’t worry about George, I hear he’s doing okay these days). Steve Jobs (Mr. Apple) became the majority shareholder of the newly spun-off Pixar. Over a period of ten years, the company’s identity changed from a computer company that did animation on the side, to a computer animation studio, with Lasseter overseeing all of their projects. You may have heard of some of their films: Toy Story, A Bug’s Life, Monsters, Inc., Finding Nemo and The Incredibles. Fast-forward to 2006. Disney animated movies haven’t had a great run for several years. They had been getting beat at the box office time after time with their traditional hand-drawn animated films versus the new CGI-based films. In 2004, Disney attempted talks with Pixar about a new distribution pact, but tensions ran high, and talks broke off. A groundswell of activity from former Disney execs (started by Roy E. Disney, Walt Disney’s nephew), called “SaveDisney” forced then-CEO Michael Eisner out, and put Bob Iger in place. Iger wasted no time as the new CEO, he promptly resumed broken talks with Steve Jobs, and on January 24, 2006 Disney announced they would acquire Pixar for $7.4 Billion. On January 25, 2006, John Lasseter returned to Disney on his white horse, and to much heralded fanfare by his new employees and Disney fans everywhere.